President George W. Bush essays examine the 43rd President of the United States that served from 2001 to 2009. George W. Bush served as the 43rd President of the United States from 2001 to 2009. 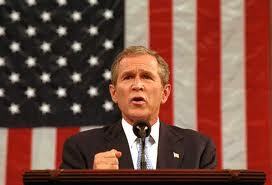 When writing a research paper on George W., you will want to focus on one particular aspect of his political career. Paper Masters will custom write you a research paper on President George W. Bush or you can use what you see here to get you started with your own writing. Prior to serving two terms as President he served as Governor of the state of Texas from 1995 to 2000. George was born to parents George W.H. Bush and Barbara Bush on July 6, 1946. George W. Bush had four other siblings -3 brothers and a sister. Bush attended Yale University and graduated in 1968. A few years later he graduated from Harvard Business School and began working in the oil industry. In 1977, he married Laura Welch who was a teacher and librarian. The young couple settled in Midland, Texas. In 1981, Laura gave birth to their twin daughters Barbara and Jenna. After a failed attempt to secure a position in the House of Representatives in 1978, he returned to the oil industry and established some small, side companies. In 1998 he moved his family to Washington D.C. to help his father in his campaign for the Presidency. After his father was elected, he returned to Texas and purchased part of the Texas Rangers baseball team. In 1994, Bush announced he would run for the position of governor of Texas. While governor, Bush helped decrease the tax rate, helped reduce domestic violence, pushed for improvements in education, and helped Texas become a lead state in wind power. In June 1999, Bush announced his intent to run for President of the United States. He was elected in 2001. His agenda for domestic improvement was overshadowed by the September 11th terrorist attack. After the attack, war was declared on Afghanistan. Over the course of his eight-year term, his popularity slowly dwindled and continued to get worse after the economic recession. Hurricane Katrina was the second disaster that happened during Bush’s term. Bush was criticized for the federal governments response to the disaster. George W. Bush Presidential Center essays examine the building opened by George Bush on the campus of Southern Methodist University in Dallas, Texas. Bush Tax Cuts Research Papers discuss the tax cuts that were passed in 2001 and are to expire in 2010 if not extended. Republican Party - Republican presidents of the Republican Party were Ronald W. Reagan; George H. W. Bush; and George W. Bush. Order a research on the Republican Party from Paper Masters. Iraq War Coverage Term Paper delves into an example of an order placed on the comparison of the different types of media covering the war in Iraq. George Bush essays on the 43rd president who came into office in January 2001. Presidential Power and the Modern President research paper is an examination of the Richard E. Neustadt book on the Presidency. Paper Masters writes custom research papers on President George W. Bush and examine the 43rd President of the United States that served from 2001 to 2009.